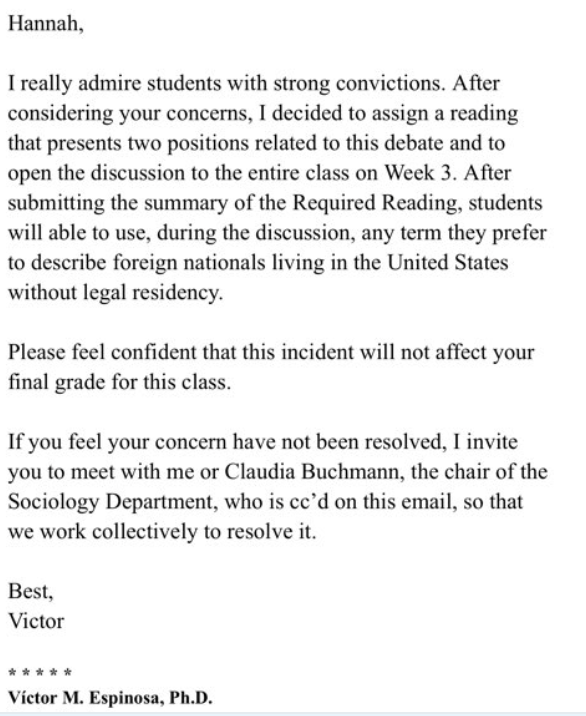 A student at Ohio State University recently came forward to fight back against her professor, who banned her and other students from using the phrase “illegal immigrant.” He told her that “unauthorized immigrant” was the only phrase he’d accept in her work in his class. So she went to the media. Now, Professor Victor Espinosa is changing his tune —first slightly, and then completely. Though he never replied to a request for comment from The Daily Caller‘s Mirror blog, he responded to the student with a compliment, but not necessarily a change of heart. Espinosa told Hannah Emerson, 19, that during one class, he will allow an open debate on the matter in which all students will be able to use any phrase they want. He has assigned a reading that presents “two positions” on the matter. “I still am concerned though because I think he’s only allowing me to use the term during week three. But we’ll see,” she wrote me. She pushed harder. 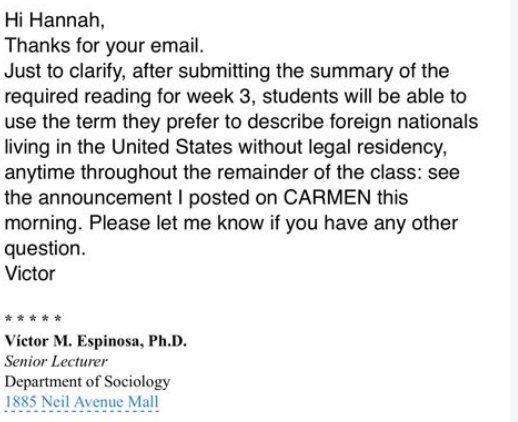 She wrote Espinosa for clarity on what he meant about students being able to use whatever term they want for the entirety of his class. “He’s allowing the class to use whatever term they want after week three. I know for a fact that this would not have happened, meaning he wouldn’t have changed his policy, if you and others hadn’t written articles,” Emerson wrote The Mirror.